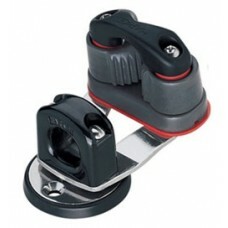 Mainsheet Cam Cleat: A swivel base for mainsheet. Includes a swivel base, bullseyes fairlead, and standard cam cleat. The base rotates 360 degrees making it easy to cleat an un-cleat from any angle.